I didn’t have to earn money at any cost, as I started to from 2013 when it had become a full-time job. I didn’t have a backache at the end of the day because I didn’t have to carry two lenses, a heavy tripod, and a fluid head. I could think that I could create less footage than I have to do today (I used to walk, now I have to run). Producing microstock today can become only a second job for many of those who read this post. In 2013, I was under pressure while filming Berlin. I had to shoot the whole city in three days, and I had to film every single subject with the sun behind it. My anxiety rate stood up: microstock was the only way I had to make money, not anymore a GREAT way to visit the world and pay my flight tickets with my sales. Create something that is completely yours. But to earn the money you need to do this second job a full-time job you have to wait years. With my course, I can teach you how to do it in less time, but I’m not Houdini. That’s why I’m sure the average visitor of this blog more likely will work in the peaceful Paris 2011 scenario, not in the anxiolytic mood of the Berlin 2013 scenario. I spent my best professional moments in European Capitals with the camera around my neck. To produce content that sold I had to run away from the comfort zone of being just a tourist, but only microstock allowed me to earn the money I needed to book the next trip and gave me a lot of professional satisfaction. 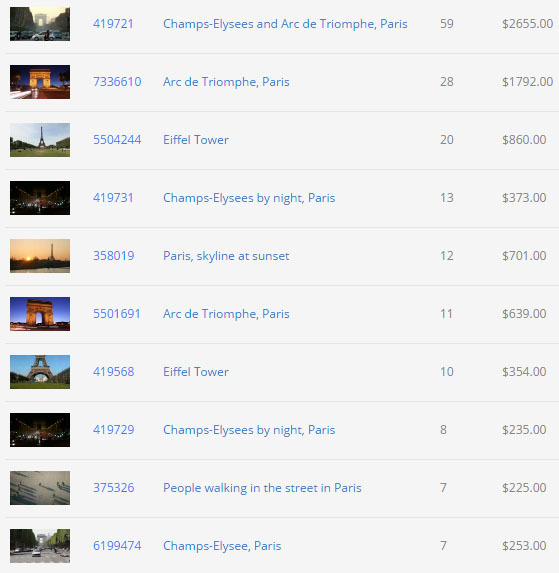 Since I’m not rich, thanks to stock footage, I travelled more than I could do. Without Pond and Shutterstock profits I probably would have visited one or two places a year. The best time to create microstock is in spring. Old-school photographers who consider only the artistic side of photography might not agree with this statement, but I’m an entrepreneur and not an artist playing guitar in the street and asking people for a coin. Mine is not a technical consideration. We all know the parable of the sun is the lowest during the winter solstice and the highest in June, so the light with the best angle is in December (in the northern part of the globe). But going to London in January, as I did once when I was a newbie, means not only suffering cold but also working with 18 hours of darkness. You can’t do that if you want to earn real money. With this in your mind, spring represents the best compromise, unlike the season symmetrical to it, autumn, which is full of colors (I’m talking about leaf colors) that make the shot unusable in video projects set in other months. Leaves are red in this video. How can a buyer buy that footage if he’s talking about summer or spring in his video? You can see red leaves on trees for only two or three months a year. On the contrary, you can see green leaves for six months. What’s the best choice for a microstock producer who wants to find the more buyers he can? Now think about this: during April people use neutral clothing. They don’t wear T-shirts, but they also don’t wear coats. Something not completely different from the clothes they wear in February and from the clothes they wear in June. The period of the year. The historical period (in 2011 there was less competition!). Today those earnings with that subjects are impossible for a 2/3 days shooting. My Pond5 best sellers with the keyword Paris (They come from three different trips). I used to take a low-cost flight, regardless of the weather forecast. I used to visit cities and at the same time shoot stock images and stock footage. I didn’t schedule my trip. I’m not telling you that those days have finished because I want to break your dreams. I just want to be honest. This is what happens today, but there are still a few little things to do if you want to sell your content and earn hundreds of dollars for every trip you make. Choosing the right period of the year is one of those.